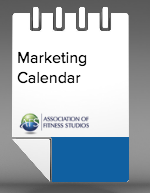 Use the AFS Marketing Calendar to keep your expenses in line and your marketing efforts on track! It's a typical rule of thumb that you should spend 5-10% of your gross revenue on marketing. The question is, where and how should you spend that money. Stay organized and maximize your success!